Jesse Ertz had 12 carries for 95 yards and two touchdowns in Kansas State's win over Baylor on Saturday. 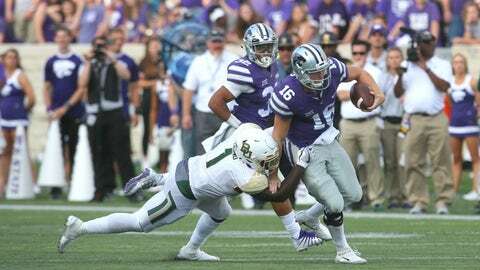 MANHATTAN, Kan. — On an inconsistent day for the Kansas State offense, one player emerged amidst the dropped passes and potential big plays that went bust: Kansas State’s dual-threat quarterback. Ertz had 12 carries for 95 yards, including a 15-yard run in the third quarter to extend the Kansas State lead to 27-13. The Wildcats tipped the balance of their offense in the second half with just five pass attempts compared to 23 rushes. Baylor head coach Matt Rhule had seen a big-play quarterback the week before in Oklahoma’s Baker Mayfield. However, when compared to Ertz in the quarterback run game, Rhule gave the edge to the Kansas State signal caller. “Baker doesn’t run the football as much as Jesse and he (Ertz) is more of a power runner.” Rhule said when comparing the two. For the game, Kansas State (3-1,1-0 Big 12) ran the ball 43 times for 225 yards and two touchdowns. After falling behind 17-3 at the half, Baylor (0-5, 0-2 Big 12) had a chance to tie, but a bad snap over the head of Zach Smith was recovered by Kansas State near the end of the third quarter. Smith finished the contest with 291 yards passing on 44 attempts and one touchdown. Kansas State: The Wildcats are now 10-5 after coming off of a bye week since 2009. Baylor: The Bears fall to 0-5 for the first time since 1978. Kansas State should receive votes in the AP Poll this coming week. Kansas State: The Wildcats are at Texas Saturday. Baylor: The Bears play at Oklahoma State on Saturday, October 14. Following the game, Rhule feared that punter Drew Galitz may be out for the season, as he suffered a non-contact injury during the opening kickoff.